I have a confession. I have scarred my children for life because of bad nail clippers. I feel like my hands are giant and clumsy compared to the small, nimble baby nail clippers. I, without fail, always cut my children’s nails too short. It ends up being a fight and way too dramatic to just cut some nails real quick! Recently Nuby sent me their Nail Clippers to review and it has changed cutting nails in my home forever. Because they are the perfect size for adult hands, but the blade is small enough for a baby’s nails, it works perfectly. They even come with a hygienic cover to keep your clippers clean from germs and dirt when not in use! 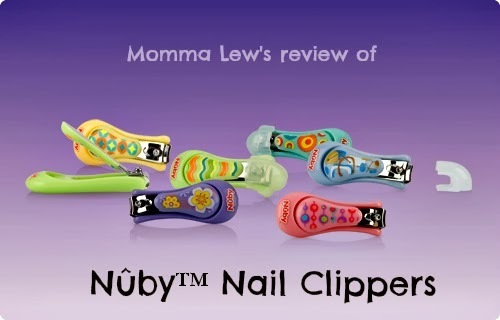 I told my son that Nuby sent me nail clippers that help mommy be less clumsy when using them and he was thrilled! They really do make it a lot easier to hold and clip nails! Read my reviews of other great Nuby products here! I received this product as compensation from Nuby. Regardless, all opinions expressed are solely mine and I only review products that I believe will be beneficial to myself & my readers.